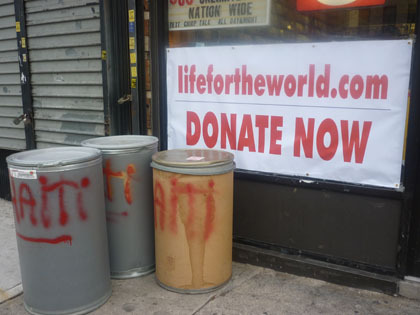 Digital Media on Nostrand Avenue in Brooklyn was spilling over with donations for relief efforts in Haiti yesterday. Cases of water and bags of clothes covered most of the floor space, barely leaving a narrow path for customers. Outside of the store barrels with the word “Haiti”were rolled in and garbage bags full of clothing lined the side door. Owner Yvens Brizard, 43, a native of Haiti, plans to travel to Haiti in the next couple of days to aid ‘Life for the World,’ an orphanage founded by Brizard’s cousin, where more than 150 children are starving. Twenty-three percent of all Hatians in the United States live in New York City, and many of them are concentrated on Nostrand Avenue. Places like Digital Media serve as a venue for them to express themselves during this crisis. Many bring in pictures of their family members and listen to the news reports as they come in over the radio. “Lots of people come here for support, and we give it to them,” said Brizard. He is holding it together for his community in spite of his own loses. One of his best friends died in the earthquake, and his father is still missing. When he goes to Haiti, he plans only to work with the children instead of searching for his father, which he considers a nearly impossible task. Brizard and his crew will fly into the Dominican Republic and then take a bus into Haiti. They have a plethora of donations and plan on taking them all by stuffing as much as possible into carry-on luggage, sending some supplies ahead of time and paying for extra baggage. His cousin, the founder of ‘Life for the World,’ helped him plan the best possible route into the city and tried to make him aware of the severity of the situation. Digital Media only accepts donations of food, clothes and medical supplies because even American money is no good in Haiti right now. With the current death toll at nearly 70,000 and many more dying each minute, the Nostrand community is thankful for what Brizard and his crew are doing. He then went on a seven-fight winning streak before losing his last two bouts, both under the Strikeforce banner. Much like Day, he will be looking to this bout to help propel him back into the limelight. Thanks for this cool article. i found your blog on google and find it is very useful. I just discovered your blog while searching for some songs and videos. The layout is quite wonderful and I must appreciate the effort you do in posting useful stuff here, thank you mate.